The ASUS XTION PRO LIVE is the world’s first and exclusive professional PC motion sensing development solution. You can make your fantastic ideas come true and introduce a better future to the public. Multiple sensing functions to make development easy. The Xtion PRO LIVE uses infrared sensors, adaptive depth detection technology, color image sensing and audio stream to capture a users' real-time image, movement, and voice, making user tracking more precise. The Xtion PRO LIVE development solution comes with a set of developer tools to make it easier for developers to create their own gesture-based applications without the need to write complex programming algorithms. In addition, the Xtion PRO series also supports the Unity3D game engine to make game/app development easier. With Xtion PRO series, developers are offered more options and tools to develop their own applications. Let your imaginations and applications run wild! Gesture detection The Xtion PRO LIVE development solution tracks people's hand motions without any delay, which turns your hand into a controller. It has more than 8 predefined poses to allow you to push, click, circle, wave and much more– perfect for use controlling a user interface. Based off this function, it can be widely developed into various types of applications, saving developer’s time and effort for developing software. Whole body detection The Xtion PRO LIVE development solution allows developers to track a users' whole body movement, which makes it ideal for whole body gaming, while also supporting multiple player recognition. RGB Xtion PRO LIVE enables color (RGB) image sensing. With RGB, Xtion PRO LIVE can capture the users’ image, which is useful for human detection, digital signage, security system and more applications to be created. 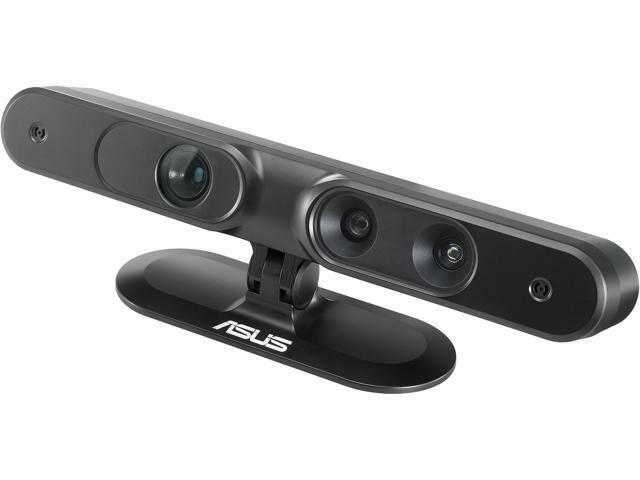 Especially designed for developers to create various applications and ASUS Xtion Store The Xtion PRO LIVE development solution allows developers to apply the latest motion-sensing technology in various applications and industries to stand out from the competition. The Xtion PRO LIVE development kit is widely open. You can create your own apps for business or for making people's lives more convenient and intuitive. Anyone can develop their own apps. A far-reaching application can be created and applied based on the developers’ imaginations. The ASUS Xtion store is a perfect online market for developers to easily and quickly sell their games, applications and other software. Easy to use The Xtion PRO LIVE features an easy plug and play USB design, with the Xtion PRO LIVE development solution OPNI NITE middleware compatible. Other Thoughts: Cannot return for refund or replacement ("not elligable"). I feel fraudulently cheated. Unit cannot achive full 60 frames per second as advertised. Pros: Arrived fast, installation is simple after Ii figured that it does not run on Windows 8 - which is ok, not a big deal. I am still working with the device, but thus far no problems. Pros: Seems like a great product for a programmer making kenect like applications. Cons: THIS IS NOT A USER WEBCAM. If you simply select webcam in the newegg selection list and sort by price you will find this product in the top row. BUT THIS IS NOT A WEBCAM FOR USERS. Other Thoughts: Must read the details (i didn't bother) or you'll be shipping this back. I received a used product as the box was razored and nothing wrapped. Same as the last guy apparently, I was also lazy picking a nice webcam and didn't read the details that THIS IS NOT A WEBCAM. 7 out of 16 people found this review helpful. Did you? Other Thoughts: Excellent device; it's MUCH smaller than the Kinect, and the USB-power makes it MUCH easier to mount and use in interesting places, and keep in a laptop bag. Also, since I use point-cloud data that I subsample anyway, the 60fps is a huge win for better interactivity. Neither the Kinect nor the Xtion work in sunlight, but in tests I've found the Xtion works better in open shade. I have dropped mine several times from 5'+, and it still works fine. I use both Kinects and Xtions, and the Xtion is my preferred device - but note I use only the depth map and do my own processing of the point cloud, not skeleton tracking - as things stand now, the Kinect SDK does better skeleton tracking than OpenNI. If skeleton tracking is your most important criteria, and you don't care about being locked into MS, go Kinect. For everything else, this is a better choice. Cons: This product has been discontinued at newegg.com. Other Thoughts: It is unfortunate that this product has been discontinued but is in keeping with Asus' modus operandi. They tend to make a tentative product and just see if the market is worth getting in to. 0 out of 35 people found this review helpful. Did you? Pros: It's much smaller and lighter than Kinect, and totally USB powered. We use it with Nuvixa StagePresence to record and hold web meetings, which we run on a Windows laptop. It's a fantastic combination with StagePresence since it makes everything much more mobile. Also the RGB sensor is more sensitive than Kinect, thus the video quality is better. Cons: More expensive than Kinect, but worth it. Pros: Works, comes with software on DVD including an application to demonstrate the video and distance features in real time, comes with API that works in linux too.